We’d love your help. Let us know what’s wrong with this preview of Starter Set by James Wyatt. Ideal for a group of 4 – 6, the Dungeons Explore subterranean labyrinths! Plunder hoards of treasure! Battle legendary monsters! To ask other readers questions about Starter Set, please sign up. would this starter be enough for someone who wants to DM for the first time? 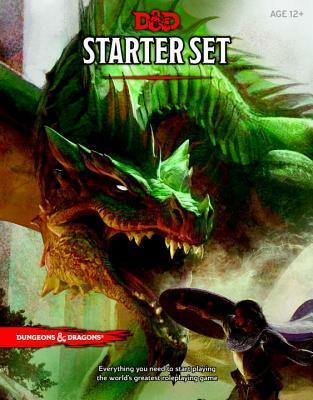 Like the 3rd edition starter box, the 5th edition Starter Set offers an inexpensive way to give D&D a try. The included adventure, while not destined to make the list of "Greatest D&D adventures of all time," is still solid including all the hallmarks of a traditional D&D adventure. It's no The Keep on the Borderlands, but it's plenty good and it succeeds at what it's meant to do: introduce new players and DMs to the game. AND it comes with a nice set of dice. I'll be running a Dungeons & Dragons campaign starting this week with this set. We bought the Starter Set some time ago for my son, and upon opening it up, were sadly underwhelmed by the contents. Two booklets, some dice. No battle maps, no character pawns or tokens, and the same artwork is used on the cover of both booklets. Compared to some other companies' introductory packages, it failed to wow the imagination. My boy left it untouched and eventually gave it to me. Flash forward a year p I'll be running a Dungeons & Dragons campaign starting this week with this set. We bought the Starter Set some time ago for my son, and upon opening it up, were sadly underwhelmed by the contents. Two booklets, some dice. No battle maps, no character pawns or tokens, and the same artwork is used on the cover of both booklets. Compared to some other companies' introductory packages, it failed to wow the imagination. My boy left it untouched and eventually gave it to me. Flash forward a year plus. We've been playing another RPG in a monthly game, and my players (son and now daughter included) really want to play D&D. They know the brand even if they don't know the game. They are ready for more options, more crunch, etc... So I start buying additional D&D content in preparation for our campaign. And finally, I break out the Starter Set and read through it. At this point, I've also played in two one-shot 5e games myself for podcasts.. And I've got to say, I'm really impressed with both the rules and the content of the Starter Set. The rules are laid out very simply, easy for someone who skipped from AD&D to 5e without ever playing 2, 3, 3.5, or 4th edition to follow. And the adventure, "The Lost Mines of Phandelver," is great. Fantastic story that has a mix of dungeon crawl and open sandbox, combat and role playing, which divides easily into four or five sessions. I'm super impressed with it and eager to dive in. I got this set for $12.99 on Amazon, and it is now $11.99 (retail $19.99). For such a low price there is a lot of value in this box. First, a quality set of dice which will set you back $7-9 alone. The basic rulebook gets the game moving along with enough info for characters up to level 5 and enough monster and DM info to play the included adventure: The Lost Mines of Phandelver. I've been running this adventure with a new group of players, currently 6 weeks in and 2/3 done. The story is very go I got this set for $12.99 on Amazon, and it is now $11.99 (retail $19.99). For such a low price there is a lot of value in this box. First, a quality set of dice which will set you back $7-9 alone. The basic rulebook gets the game moving along with enough info for characters up to level 5 and enough monster and DM info to play the included adventure: The Lost Mines of Phandelver. This is a great introduction to playing Dungeons and Dragons, not just for players but also for dungeon masters. If you have ever wanted to run a game as a dungeon master, but were always intimidated by the thick rule books, then this is the perfect way to start. Everything is clearly explained without being overwhelming. Also, the sample adventure can give you a lot of hints how to write your own adventures and design your own dungeons. I started out with the Holmes version of Basic Dungeons and Dragons around 1980, so I am both well-informed, but probably also somewhat biased, in my reading of the newest “basic” version of the game. After all, what we encounter at the age of ten tends to make a deep impression. Still, I do find this introduction to the Fifth Edition of the game I’ve been playing since childhood to have some merits. Let’s start with the “basics” (heh). Dungeons & Dragons is the world’s first and historically I started out with the Holmes version of Basic Dungeons and Dragons around 1980, so I am both well-informed, but probably also somewhat biased, in my reading of the newest “basic” version of the game. After all, what we encounter at the age of ten tends to make a deep impression. Still, I do find this introduction to the Fifth Edition of the game I’ve been playing since childhood to have some merits. Let’s start with the “basics” (heh). Dungeons & Dragons is the world’s first and historically most successful role-playing game (RPG). Traditionally played around a tabletop, players pretend to be warriors and wizards in a heroic fantasy setting and battle monsters and accrue treasure. While the game was invented as an extension of tabletop wargaming, and thus was originally envisioned to involve strategic use of miniature figures representing the players and their adversaries, many of us simply used paper, pencil, and imagination to create the worlds and situations to overcome. Hence, it often became a less strategic game, and more of an expanded version of “let’s pretend” with rules, which is how its creator, Gary Gygax, described it more than once. The game has undergone many variations and editions, more in fact than the current designation of “Fifth Edition” would suggest, since this was preceded both by “Original” D&D (OD&D) and by the version of Basic invented by J. Eric Holmes (and the modifications made by Tom Moldvay shortly after I came on the scene). The rules grew out of a series of handwritten notes and conversations between Gygax and the young Dave Arneson, and for many years the only way to learn the game was to play it with someone else who understood them to some degree. House rules varied widely from place to place, and in some areas (such as Intiative and Surprise), even Gygax admitted that he didn’t play strictly by the book. Over the years, the development of many different role playing games has resulted in a much clearer set of rules that can actually make sense to people who haven’t been initiated into the secrets by established players, and I will confess that this is a Good Thing. It’s actually fairly likely that 12-year-olds can pick up these rules, read them through, and start playing a game with their friends that is pretty much like the games they will encounter at conventions, in other circles of friends later in life, and in general, anyone playing the game. Old-time players like myself are sometimes referred to as “grognards,” and we have a reputation of being grouchy about the newer editions of the game. Some of that applies here, although here I admit that this version appears better than the last one. The Fourth Edition seemed to me to favor the players to the point where it was much too easy to quickly rise to superherodom and there was little risk to balance the rewards given to adventurers. This version curtails that somewhat (and therefore will probably be unpopular with fans of the Fourth Edition, who will one day be old grognards themselves. So it goes…). Still, if I were running a game, I’d probably change a few things. I think level progress is still too fast and easy in this version. I’ve always enjoyed the challenge of the lower levels more than the easy successes of the upper ones. I think that the classes overlap too much, blurring the distinctive roles of each character to give everyone a chance to participate in everything that comes up. In this version, not only can wizards use swords (! ), but they have offensive “cantrips” which allow them to deal damage every turn of combat, so there’s really nothing that special about being a fighter. Fighters, meanwhile, have the ability to heal themselves once per day, making clerics less important party members. And everyone starts off with way too many hit points (though at least this applies to the monsters as well). The structure of the rules is interesting, following the outline of my old Holmes edition in some ways, but not in others. We get two books: a “Rulebook” which is for everyone, and an “Adventure book” which is really for the Dungeon Master. This is similar to the Basic Set’s rulebook and Module (“B2: The Keep on the Borderlands” in my day), but there are interesting differences. The only monster stats you get are for the monsters included in the adventure, and these are in the Adventure Book, not the rulebook. The same goes for magic items. If you want to include monsters and treasure not specifically listed in the adventure, you have to buy more books. Actually, because of the rapid level progression, you’re going to need more books after running through the sample adventure anyway, since the rules only take you to level five. Holmes only went to level three, but you could finish both B2 and the “Sample Dungeon” in the rulebook and still have characters below that, allowing for many further session before you needed more products. Even more extreme, the Starter Set includes no rules for character creation or designing adventures. You play with the five “starter” characters provided, you run the one adventure, and then you need to get something more to proceed. Short version: I really like it. I think it's a good introduction to RPGs, and a great introduction to D&D 5th Edition. The adventure is solid, too. Definitely recommended. - I love advantage and disadvantage. I kinda want to use it in everything, it's so fun and easy. And its use throughout the game is better than the many fiddly subsystems f Short version: I really like it. I think it's a good introduction to RPGs, and a great introduction to D&D 5th Edition. The adventure is solid, too. Definitely recommended. - I love advantage and disadvantage. I kinda want to use it in everything, it's so fun and easy. And its use throughout the game is better than the many fiddly subsystems for bonuses/penalties of the past. - The proficiency bonus and passive Perception are efficient mechanics as well. - The verbiage is rather more elaborate than strictly required. This should have been written in a more readable style, something journalistic or fifth-grade. - There are far too few examples. It's especially a problem for certain funky mechanics, like those for spells, which even a veteran like me had trouble deciphering - imagine a new player reading them! - Love the art style. - I like the advice here, especially the early bit that RPGs aren't about winning or losing. - The structure is good, too. Skills, for example, are well-explained. Combat is nicely laid out as well. - Tables and diagrams would have been really helpful at several points (especially for spells). - I like that they went to the trouble of explaining rules conceits like the lack of skills for Constitution, and what hit points are. - Spells in general are better and easier to use than previous editions (though some could still use work). - We needed examples of each of the saving throws for each ability. Strength, Intelligence, and Charisma saves especially. - Bonus actions are a little funky, but a nice compromise. Critical hits as well. - I wonder how often the rule about concentrating to ready a spell will be remembered. - Resistance and vulnerability and wonderfully straightforward. - Death saves are interesting. Though I think they could have been clearer about it being 0 or less when they kick in (as opposed to just "0"). - Their way of explaining movement through difficult terrain (where you add extra distance to the movement) is weird to me, but I guess there must be a good reason. I'm still not sure why it just isn't x2 or x3, though. - The whole "spending Hit Dice" thing for rests is weird, but OK. I also don't get why you have to have at least 1 hp for a long rest, and not 0. - I like the way they handle ammunition and weapon properties. - Odd to have proficiencies for some mundane equipment. - Interesting that they left most of the equipment undescribed. - I like replacing those series of spells of a type (i.e. cure) at different levels with single spells that get stronger when cast at higher levels. Efficient and saves on bookkeeping. - I like the idea of component pouches, but if specific components can still be consumed, doesn't that put you back at micromanaging? - They included way too much coverage of edge cases in the spellcasting. Some things could have been left for the full-fledged rules. - Some of the new core spells (new to me, anyway) are cool, like Healing Word, Revivify, Misty Step, Spirit Guardians, and Thunderwave. - I would have preferred a flat bonus to 1d4 on spells like Resistance. - I think they missed an opportunity to consolidate conditions more (like "grappled" and "restrained", or "stunned" and "paralyzed"), but oh well. - The title is a little goofy, but oh well. - I like the DM advice, a lot. It fits the "rulings not rules" approach I lean towards. - I wish the monster stat blocks were in the adventure itself and not just the appendix. Hate flipping back and forth or having to create a separate copy for reference. - Magic items being at the end is less an issue, since those won't likely be used immediately. - Attuning magic items is interesting. - The adventure overall is a bit generic, but good as an introduction to D&D. The history behind Phandelver and Wave Echo Cave is cool too. - The general way the adventure is structured is excellent, especially the obvious thought put into what players will actually do in a game. I hope future 5E adventures follow this pattern! - I like that XP is awarded for non-lethal solutions, and sometimes you even get more for it! - I wish the parts were more interchangeable than they are, and didn't necessarily have to be done in order. I mean, you CAN go right to the castle (which seems like the obvious choice for heroic characters), and they do make allowances for it, but it's pretty clear skipping the intermediate steps will go poorly for your PCs. - The town of Phandelver is a good location. Lots of potential there as a home base. - Wolves are scary. The dragon is crazy scary! - I like the traits for humanoids. Nice for distinction. - I like the layout, and the emphasis on role-playing elements. Very nice sheet overall. Enjoyed playing it more than reading it. Oh Sóley Veiddurafvindu, my cleric of life, my wood Elf, my beloved collector of penises. You will be missed. If you have never played D&D before (like me), then you will need more than just this starter set to figure out what is going on. Ideal audience for this starter set is people who have played previous versions of D&D and need some help/example quests to get them into the new 5th Edition. Or maybe people who have played D&D but want to learn how to become a Dungeon Master (DM). 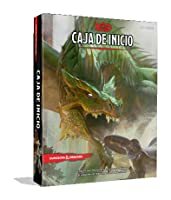 Comes with two books, one is the rules of play and logistical flow of the game, second is example adventures If you have never played D&D before (like me), then you will need more than just this starter set to figure out what is going on. Ideal audience for this starter set is people who have played previous versions of D&D and need some help/example quests to get them into the new 5th Edition. Or maybe people who have played D&D but want to learn how to become a Dungeon Master (DM). this edition is less of a game and more of marketing exercise. WotC has designed 5e as a snare for players who are osr or still playing older editions. I almost gave this book 2 stars because I know not to buy the others. it is sad that WotC has chosen to treat it's customers with complete contempt. oh well. if you "had" to get a game anyway 5th still belongs in the "don't bother bin". 3rd or 4th edition (or cyclopedia) are just as good. other games would likely be more appealing. savage worlds, b this edition is less of a game and more of marketing exercise. WotC has designed 5e as a snare for players who are osr or still playing older editions. I almost gave this book 2 stars because I know not to buy the others. The adventure is standard fare but (again) great to learn the rules. The box is oldschool greatness but the fact that the booklets don't have a slightly sturdier cover than the pages is annoying.... and should be remedied in future D&D publications. This turned me from partially interested to full-fledged fan (core books in the mail!) in a matter of days. It is well explained and you get a lot of bang for your buck with this, particularly through Amazon. Wizards of the Coast have seen fit to toss you in w/o being bogged down with character creation, in this fascinating starter set. There are three books seen as Core Rulebooks for D&D, the first of which - and arguably the most important one - is the Player's Handbook. The Player's Handbook has well over 200pages devoted to character creation - making the choice to exclude that information from the Starter Set a rather bold one. Seeing as that information is available for free, in a brief for Wizards of the Coast have seen fit to toss you in w/o being bogged down with character creation, in this fascinating starter set. There are three books seen as Core Rulebooks for D&D, the first of which - and arguably the most important one - is the Player's Handbook. The Player's Handbook has well over 200pages devoted to character creation - making the choice to exclude that information from the Starter Set a rather bold one. Seeing as that information is available for free, in a brief form, on the D&D website - you aren't exactly *prevented* from knowing this key information - but the focus on gameplay at the expense of character creation is what appears to be at the heart of the choice. As I have both of these resources - I won't be able to answer the question of whether it is a mistake. Their game testers and decades of knowledge and experience are not to be underappreciated, though - and there is a certain sense in jumping in and relying on the valuable adventure (if not campaign) that is included in the kit. It seems developed with beginners in mind, but is purchased and appreciated by seasoned players (because of its quality, as I understand it). I would have been bothered, as a young person, if this were represented as an "everything you need" place to start - it really isn't, at least, not if part of what you want is to be able to play independent of the enclosed adventure, with characters of your own creation. It was a highly enjoyable read, and I'm eager to jump in with my kids. We'll be playing some simple homebrew sessions, then giving the Starter Set adventure a go when we're ready to include a couple more players, and we feel less like noobs. If you're interested in learnjng how to play DnD, this is certainly the way to go. It's a fairly inexpensive set ($15 on Amazon in Canada right now) and it comes with some dice, a 30 page rulebook, 5 premade characters (who's backstories and personal goals tie into the quest that comes with the Starter Set), and a quest called Lost Mine of Phandelver that'll take more than 20 hours to beat. I've read through the quest but have only actually played one round with my siblings, which didn't even re If you're interested in learnjng how to play DnD, this is certainly the way to go. It's a fairly inexpensive set ($15 on Amazon in Canada right now) and it comes with some dice, a 30 page rulebook, 5 premade characters (who's backstories and personal goals tie into the quest that comes with the Starter Set), and a quest called Lost Mine of Phandelver that'll take more than 20 hours to beat. I've read through the quest but have only actually played one round with my siblings, which didn't even reach the end of chapter 1, so even though I've 'read' the Starter Set, I'm not nearly done with the experience. That being said, my first round of playing LMoP was a blast. The story begins a bit weak, so I added a prologue to give the players more motivation to complete the first 'objective' the story gives you. However, I'm really impressed with the detail of the dungeons in the story, and I like how much freedom the players have in chapter 2 (which is also a bit intimidating as a DM lol). And the story is mostly compelling - much more than if I just made one up myself I'm sure. This book(let) provides a basic story for 5th edition D&D. It is delightfully populated with all the tropes and cliches you might expect in a fantasy story. In this case (unlike actual fantasy books) it works well because it does exactly what it sets out to do, and it does it well. The dwarves are hairy, the goblins are numerous, the antagonist is simply evil, and you will be sucked into a predictable fantasy world perfect for newcomers to the game. Mechanically, this intro set is wonderful. This book(let) provides a basic story for 5th edition D&D. It is delightfully populated with all the tropes and cliches you might expect in a fantasy story. In this case (unlike actual fantasy books) it works well because it does exactly what it sets out to do, and it does it well. The dwarves are hairy, the goblins are numerous, the antagonist is simply evil, and you will be sucked into a predictable fantasy world perfect for newcomers to the game. Great way to start playing D&D, which is what my wife and I just did. I attended a session of D&D as a player before taking on the DM job. I have only played D&D 2 times and another RPG based on DC Superheroes a few times. I have never been a DM. I'm running a duet using this adventure, and so far it works well. I did give my wife's character some extra oomph (hit points) so she could survive, since this was designed for a group of players rather than a single player. It is a great g Great way to start playing D&D, which is what my wife and I just did. I attended a session of D&D as a player before taking on the DM job. I have only played D&D 2 times and another RPG based on DC Superheroes a few times. I have never been a DM. I'm running a duet using this adventure, and so far it works well. I did give my wife's character some extra oomph (hit points) so she could survive, since this was designed for a group of players rather than a single player. It is a great game. It takes a bit of doing to get started if you don't simply join an established group (that's the easy way), but like many things, the more you do it the easier it gets. If you bought this and think it is too complicated, it does appear so at first. Hang it there. It pays big dividends. As an avid player for 20 years and a child of the 2nd Edition, it is with a glad and heavy heart that I admit this is the best edition so far. Easy access for the young, appealing to the old, carefully written and considered and perhaps, above all, the first system I have played which can be typically combat-heavy and yet the combat is so streamlined and easy to manage, without stalling the game. A nice starting story for those who want to get into playing D&D but don't have a DM who'd be willing or have time to write customised story. A little bit convoluted and the play might become a little too long for casual players. The starter box includes all the necessities to start the campaign: the dice, character sheet, short set of rules, and chapter by chapter campaign. Good starting adventure but you have to use the characters it gives you otherwise you may be unable to complete the adventure. This is alright for someone starting completely from scratch, never have played before, but for someone who wants to get back into D&C after years of not playing, this is only really useful as a sort of example setup for character sheets, and a pretty good first campaign. You want to learn how to play 5e? Buy the players manual. If you want to learn to DM in 5e? Get this AND a player's manual. Fantastic value. This set is essentially all you need to play D&D as a beginner, and the introductory adventure they give you, Lost Mine of Phandelver, is an excellent first timer's module with lots of sandbox potential. The box comes complete with a collection of dice and characters right out of the box, so if you can really hit the ground running. D&D has never been more accessible! Ač světu D&D neholduji (obávám se, že ani tato krabice to nezměnila) zpracování je pěkné. Přímo skvostné! Pro někoho, kdo tu hru nebere jako nutné zlo (tedy nemá spoluhráče co fňukají, že se chtějí vrátit zpět ke kořenům RPG) nebo chce s RPG začít, je to užitečná pomůcka. Great introductory material combined with a low level adventure that is absolutely wonderful. Fifth edition rules are described in short so that you won’t need the player’s handbook or dungeon master’s guide. My husband wanted to play D&D again, and he wanted me to play with him. (Apparently he likes me?) So, since I am the family rule keeper and have NO real experience with the game, of course I get to be the DM! This is a nice, easy intro as I'm learning. Simplified rules and a short campaign to run. The best Starter Set or introduction to Dungeons & Dragons yet. D&D 5th edition is the best edition of this classic RPG, and the 5e starter set is where it all begins for new players (and old). The included mini campaign "The Lost Mine of Phandelver" is FANTASTIC. Great way to start playing any tabletop RPG, especially so for 5e D&D. Great intro scenario/campaign for 5e and the Forgotten Realms. I read this hoping it would get me really excited for the latest edition of Dungeons & Dragons. Sadly, that didn't happen. This is a competent set, but there's nothing really special about it. I get that it only has booklets and a set of dice to help keep costs down and make it a really cheap entry level product, but I can't help wishing there was more here. I liked how the Pathfinder starter set had tokens and a battle map in addition to rulebooks, especially because both those extras were I read this hoping it would get me really excited for the latest edition of Dungeons & Dragons. Sadly, that didn't happen. This is a competent set, but there's nothing really special about it. I get that it only has booklets and a set of dice to help keep costs down and make it a really cheap entry level product, but I can't help wishing there was more here. I liked how the Pathfinder starter set had tokens and a battle map in addition to rulebooks, especially because both those extras were useful for more than just the included adventure. The rules and sample characters don't give me much of an idea of what's new and exciting in 5E. Advantage is a neat mechanic, and being able to cast spells with higher level spell slots to get a greater effect seems neat, but beyond that, this feels fairly similar to 3.5. I do like the roleplaying stuff that's included on each character sheet, but I wish there was a clearer indication of what, if any, mechanical impact that had.